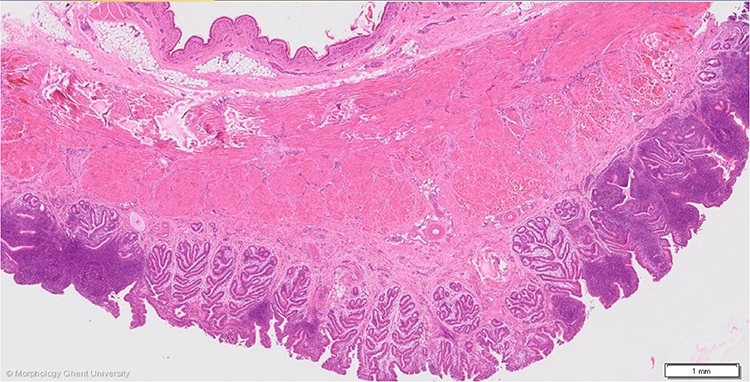 Diffuse lymphoid tissue is present in the dorsal wall of the stalk of the Bursa of Fabricius and the dorsal wall of the proctodeum (where the stalk enters the proctodeum). This area in the stalk has been termed â€˜diffusely infiltrated areaâ€™. In the proctodeum, this zone was previously termed the lymphoglandular ridge of Jolly. In contrast to the Bursa of Fabricius, these regions are characterized by the infiltration of mainly T lymphocytes and only few B lymphocytes. In the dorsal wall of the proctodeum, lymphoid follicles can occur.